All of our ministry here at First United Methodist Church takes place in Hmong and English. Our pastor is available to talk with you about the needs you have for your wedding or other event. He will consult with the Trustees of the church concerning your desired use of the facility. 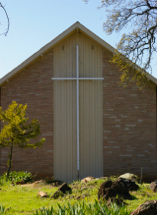 The people of First United Methodist Church are pleased you are considering our facility for your special event. We have a beautiful sanctuary which is wonderful for weddings. It holds 350 people and may be elegantly prepared for your special day. Please keep in mind that a wedding at First United Methodist is a sacred event reflecting the love of Christ for us and the love he gives us to share in the relationship of marriage. The wedding ceremony is a service of Christian worship. Our pastoral team is ready to help you prepare for your special day and prepare for a life together. Our team will conduct the Service of Christian Marriage and they will assist you in making the arrangements in conjunction with our wedding coordinator. We will invite you to worship with us on Sundays so you may get to know us and the people of our community of faith. If you desire to use our facility and have another clergy person conduct the Service of Christian Marriage we will ask you to consult with our pastors who will work with you to get approval for this. Premarital counseling is required for all weddings conducted here.